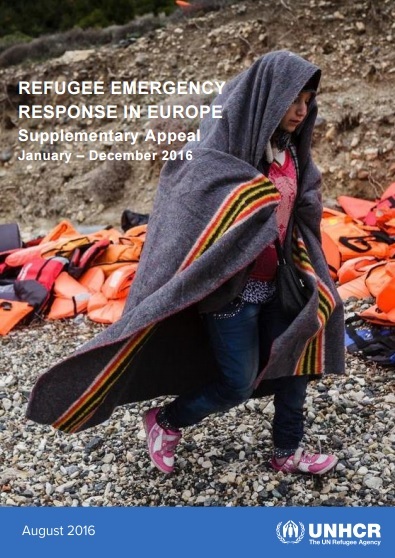 This Supplementary Appeal presents UNHCR’s revised strategy and financial requirements for its response to the situation in Europe in 2016. It incorporates UNHCR’s component of the inter-agency regional Refugee and Migrant Response Plan 2016 for Europe (RMRP). It also incorporates UNHCR’s strategy and activities related to onward movements in North Africa, and integrates a component related to targeted activities in South-West Asia. This appeal further provides for planned interventions in, respectively, countries of origin and first asylum in West and East Africa, and in the Horn. It supersedes the Supplementary Appeal for the Special Mediterranean Initiative and the Winterization Plan. Through this Supplementary Appeal, UNHCR is appealing for USD 408.4 million, including USD 374.7 million in additional requirements. Responding primarily to the movement of mainly Syrian, Iraqi and Afghan refugees to Europe via Turkey, this Appeal also complements efforts such as the Regional Refugee and Resilience Plan 2016-2017 in Response to the Syria Crisis (the 3RP), the Syria Humanitarian Response Plan, as well as the Solutions Strategy for Afghan Refugees (SSAR) in South-West Asia, the High Commissioner’s Global Initiative on Somali Refugees, and other relevant UNHCR and inter-agency humanitarian appeals.